In Europe, more than 73 million people are illiterate – an alarmingly large number. 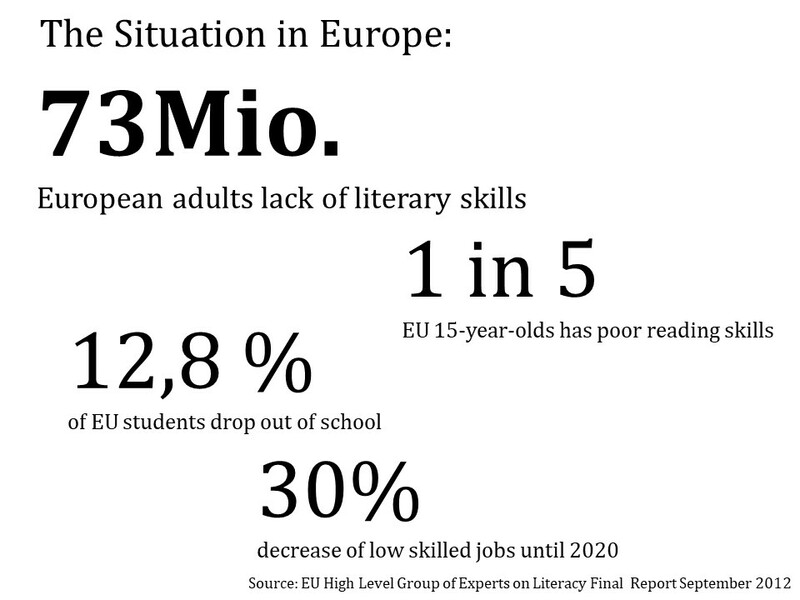 One in five 15-year-olds has poor reading skills and 12,8 % of EU students drop out of school, which will lead to a 30 % increase in low-skilled jobs by 2020 (source: EU High Level Group of Experts on Literacy, Final Report September 2012). In order to address this educational, social and economic challenge, it is vital to promote literacy in Europe and engage all age groups with reading. Therefore, EURead aims to improve reading and writing in Europe – for every member of society, regardless of their financial, cultural, or social backgrounds. Literacy is a prerequisite for education, personal development, participation in society and economic growth: the ability to read significantly influences income as identified by the OECD’s report ‘Education at a Glance’ 2014. Shared reading and reading for pleasure are positively linked to emergent literacy, wider educational outcomes and health and wellbeing.